Yesterday, we rafted the Shoshone section of the Colorado River with Lakota Guides. Our raft was filled with two other travel journalists and a PR “Story Teller”, Nicole, from the agency that represents Beaver Creek Lodge. We all had a blast and although it wasn’t the most intense whitewater rafting experience, it was the most fun. Nicole’s eager willingness to try anything thrown her way made my adventure that much more enjoyable. She “rode the bull”, laughed when she went for an unplanned swim, stood up at the front of the raft as we spun it around and tried to knock her into the water, and continuously smiled throughout the day. If there was a “Most Sportsmen Like Award” for first time rafters, Nicole would be the winner. Thanks, Nicole! You are a pleasure to be around. The Shoshone section of the river begins with Class III rapids that ease after a few miles. As the cool water rushed into the boat and we bounced around like bunnies, Nicole’s face lit up. At one point, all four of us almost fell into the rapid. Nicole grabbed the girl across from her and pulled her back into the raft just before she went in. (Arguably, it was Nicole’s fault in the first place since she was the one that fell on her, but they are just semantics in the story.) Nicole reached for her jacket, grabbed a hold of it, and pulled. We all laughed because we managed to stay safely in the raft yet we had a little more adventure than expected. 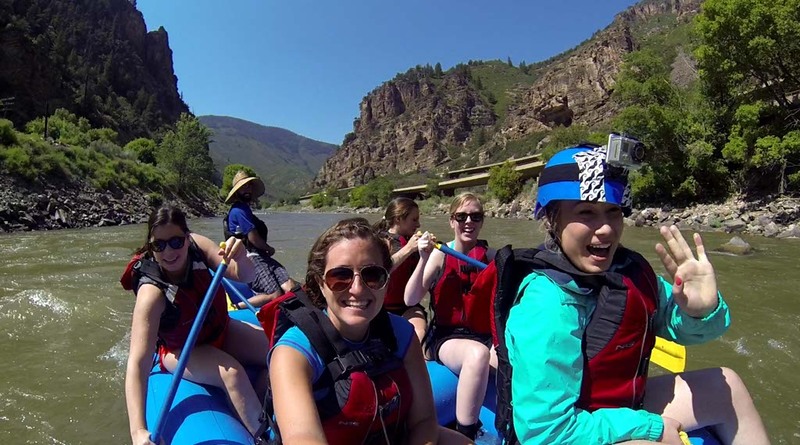 Following the Class III rapid section, Class II rapids were interspersed throughout the rest of the adventure and the beautiful Glenwood Canyon towered above with canyon walls up to 1,500 ft. This part of the trip was more leisurely so Towensend, our rafting guide, asked if someone wanted to “ride the bull”. Before he even told us what it was, Nicole agreed. Her eagerness might have been her downfall at this point, but again she is the heroine so we’ll blame Townsend, our more-than-friendly guide who would most likely be a great friend if we lived int he same state. He explained that riding the bull means to sit at the front of the raft, hold on to the yellow rope, and fling your legs over the edge as we quickly raft through Class II rapids, offering an up close and personal view of the water. Nicole jumped up and mounted the “bull” only to fall into the rapid as quickly as she got up. Townsend darted across the raft before I even know what had happened and he pulled her back in. To our surprise, she had a huge smile on her face. She wondered what she had done wrong and Townsend explained that he was going to tell her to lean back to fall into the raft if she was going to fall anywhere, but she had jumped on so quickly, he didn’t have a chance to tell her. Rather than being upset about it or stressed, she tried riding again with success. She was fearless. Swimming opportunities were abound as the warm Colorado air made the cool Colorado River very inviting. Rather than just jumping in, we (actually just Nicole) played a game. 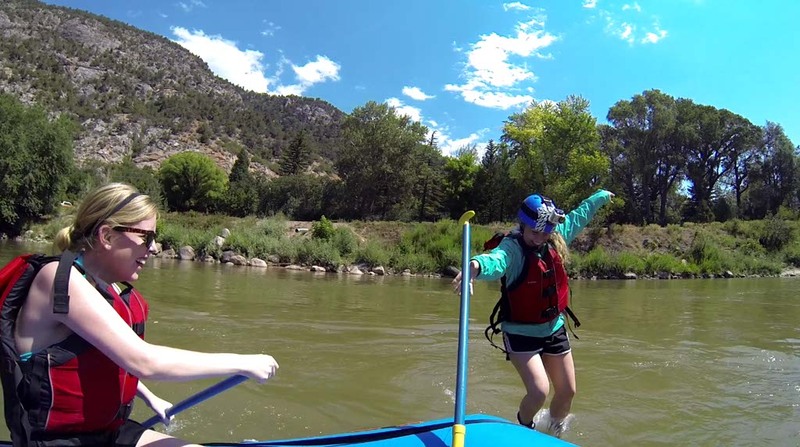 Nicole stood up on the very edge of the front of the raft while holding her paddle for balance. We spun the raft 360° twice before she finally lost her balance and fell in. It was like watching a movie in slow motion. First, she completely had her balance. I didn’t think we’d knock her in. Then, as we all paddled in unison, the shifting of the raft was more prominent. Her arm slowly moved up above her head and her other hand shifted on the paddle. She was going in. As if she didn’t want to loose the paddle, she threw in and jumped in feet first. Even just before she hit the water, she was still smiling. We called her our guinea pig. She happily tested every adventure first and the sheer enjoyment on her face reminded me of how blessed I am to participate in adventures like this. She made everyone happier just by being in her presence and for that she deserves recognition. Some people just have that air about them. Their happiness is contagious and spreads like wildfire. I often wonder how people view my personality. Do they see me as generally happy? Do they understand how much I appreciate every opportunity I am blessed with? I hope that I bring that sense of joyful spirit to others. 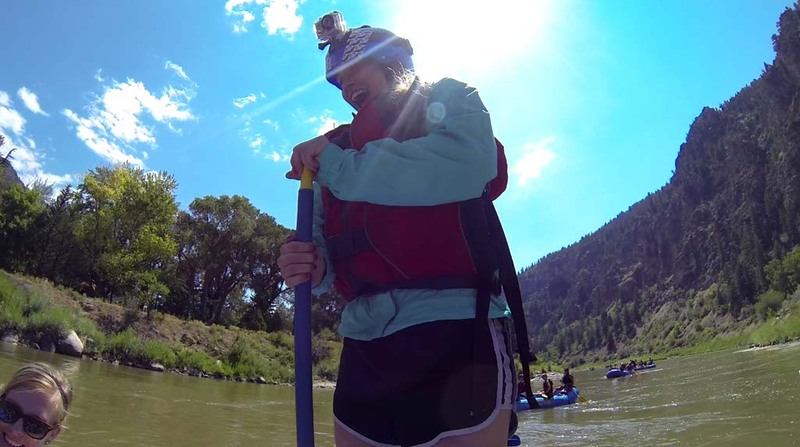 This entry was posted in Colorado, Travel, USA and tagged adventure, Beaver Creek Lodge, bucket list, Bucket List Publications, bucketlist, Colorado, Lesley Carter, travel, Whitewater rafting by lesleycarter. Bookmark the permalink. 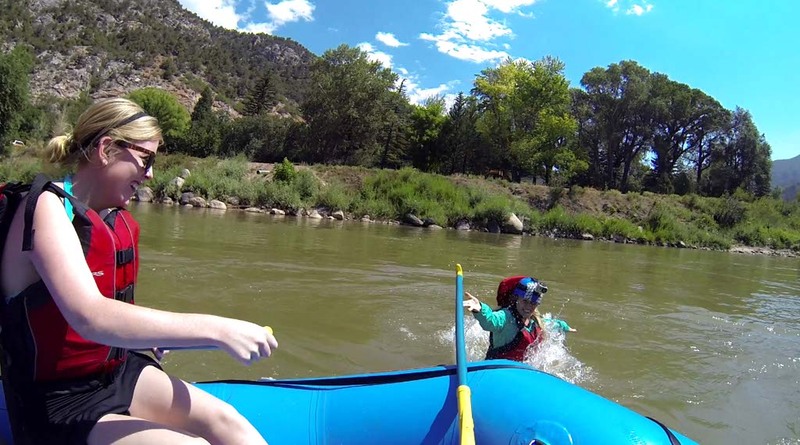 The Arkansas River by Buena Vista, south of Vail/Beaver Creek, is much more challenging. You don’t fall out on that one if you value your life. Glenwood Canyon is very pretty though. 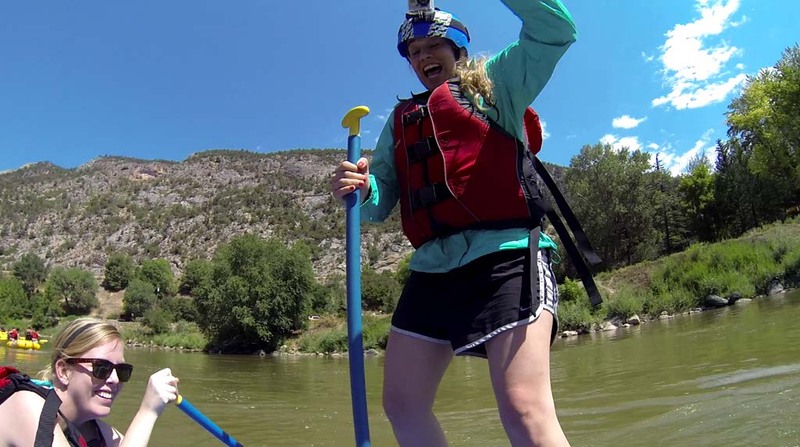 Zach went white water rafting on the Colorado River this summer and absolutely LOVED it. Keeps talking about the two of us going….it looks like so much fun! This looks like so much fun! I love the action shots of Nicole falling in. Hahaha! Whoa! I’ve always wanted to try this, but I’ve always chickened out. 🙂 I can’t swim. But this looks amazing. You don’t exactly need to swim even if you fall out of the raft. As long as you can float with the vest, you’ll be good. Usually the guides are so amazing that even when you do fall in, they pull you back up very quickly. 🙂 You really should try it; it’s amazing. I’m so glad I found your blog it’s so much fun. I’ve been on that stretch of river before, and on the Arkansas too. Beautiful places! I love those pictures. Can I ask what camera you used? You are a brave woman to take on all these challenges. You are living the dream girl! Thank you for being an inspiration to life and living! You have a great love for the outdoors too, which is encouraging. I am so looking forward to visiting Colorado and its beauty. I was surprised that it took me this long to visit the state but it certainly won’t be my last visit. It’s beyond beautiful. Let me know where you go when you make it there. I’d love to hear about your experiences. One of the great things about travel is meeting new people. It sounds like a blast. Pinned for future reference! 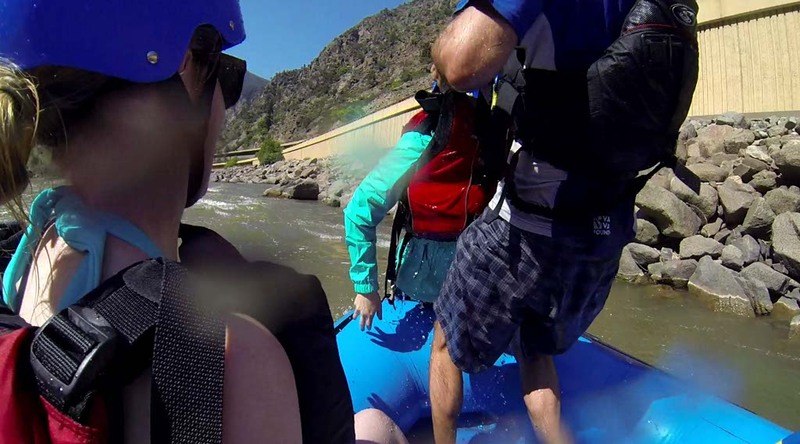 White water rafting is fun…I liked the Royal Gorge run, but it does depend on the water level/timing. That is an intense river. Fantastic. I mean, it sounds as if it would be so fun, but then to have a happy girl along! Awesome! 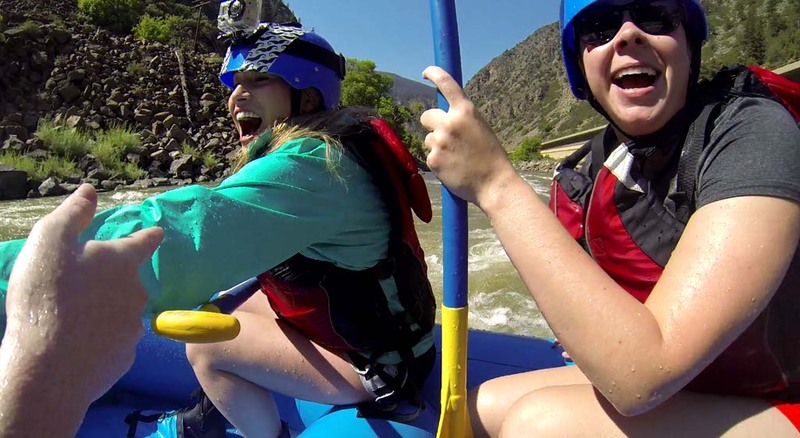 FYI- as you probably heard during the trip, for the best rapids in Colorado, it is usually best to go rafting in June or early July. This is when the snowmelt from the mountain peaks is still finishing up, and river levels tend to be at their highest. I love white water rafting and the challenge to not end up in the water, win some and lose some. I loved your description of Nicole, the photos showed her exuberance and joy and people like her remind us to laugh more and really TRY our hand at life. And yes, your happy, face radiates the same joy. Great post and great shout out to Nicole.